London Computator Corporation Sumlock 912/S. 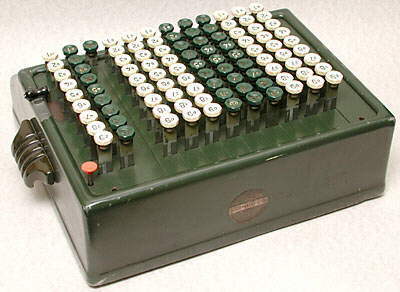 This has a direct action keyboard of the "comptometer" type. 335 x 258 x 130 mm (13.2" x 10.2" x 5.1"). 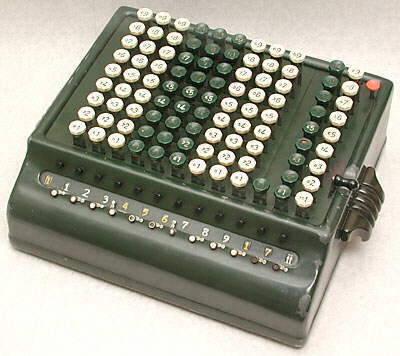 It is a model L.C/912/S where the 5 denotes the full keyboard (keys up to 9), the 12 denotes the 12 columns of keys, and the S denotes a Sterling currency version. Has 9 decades of £ keys, with columns on the right for shillings and pence keys. The pence column is abbreviated to 1 to 9. To enter a number 10 or 11 two keys have to be pressed in succession in that column to give the required number. The lever on the right is for clearing the total. The machine in the photograph above shows the total £1,123,456,789 17s 11d. The machine illustrated has serial number 912/S/8457. 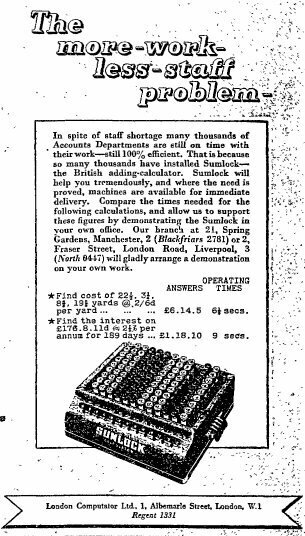 The London Computator Corporation, Limited, was formed by Bell Punch to deal with the sales side of the Plus and Sumlock machines. 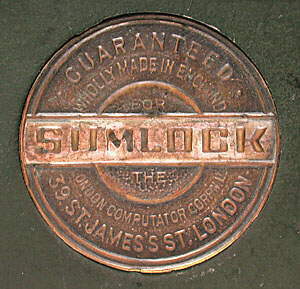 London Computator Corporation Ltd. was renamed Sumlock Limited in 1950. The mechanism of these machines operates on the return stroke of the keys and there is interlocking between the keys to prevent more than one key in a column being inadvertently pressed at the same time. Rear view, showing the "Sumlock" name badge, similar to the "Plus" badges on the smaller models. A newspaper advertisement from 1943 for this model. 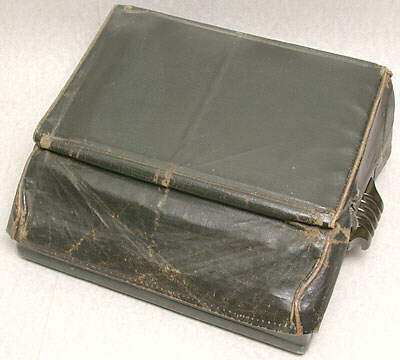 Note that this has the "Sumlock" name on the front, as was subsequently used.